Due to the significant changes that come with this version, i decided to add a beta-phase before actually releasing it. Grab it here: http://www.jpct.net/download/beta/jpctapi.zip. Added a possibility to the TextureManager to get the name for an ID. Fixed a bug when using environment mapping on multi-pass objects. Fixed a flaw in the discrete polygon and triangle strip rendering. Fixed a bug in Object3D.clone() that prevented a transparency setting from being cloned. Simplified the visibility list management. Modified the behaviour of FrameBuffer.update() to make applications work that omit the call to one of the display()-methods. Fixed a bug in the getPosition()-methods for light sources. Fixed a bug in projective texturing that caused a wrong fov-value to be set. Added the possibility to Camera to explicitly set the y-fov. Added shadow mapping using a fixed function pipeline approach with depth textures. 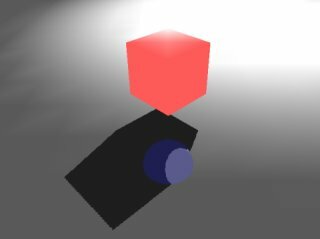 A new class in util called ShadowHelper eases shadow mapping. Added some helper methods here and there to ease shadow mapping. Added a method to Texture to add another texture's content to one. Added a new constructor to texture to create a blank x*y texture. Wow! I really can't believe how much work you've done on this. Great work. I'll give it a try. Long time Rolz! hOW IS TECHNOPOLIS? It does? Amazing! I've never expected it to work on Intel. why not? I have had very good results on intel based chipsets! Looks like an issue with filtering. You can disable it by removing the call to <ShadowHelper>.setFiltering();...or set it to false explicitly just to be sure. Does that change anything?